Tower Production has everything you need to make a Sweet Sixteen come to life. 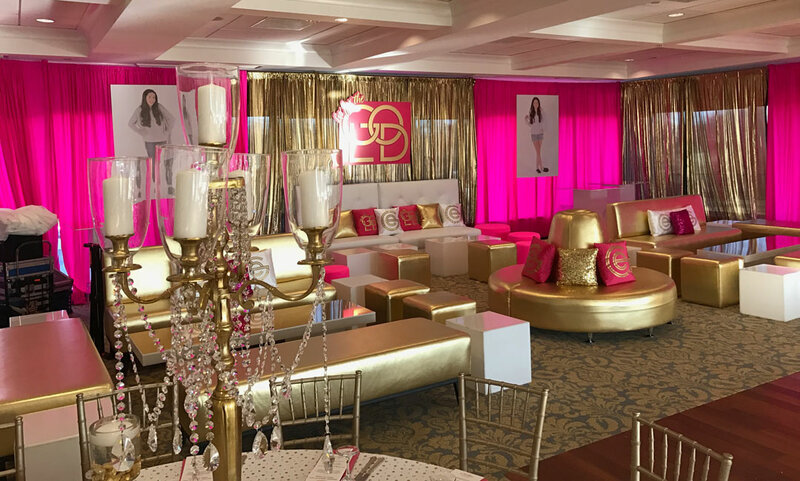 We have an extensive supply of lighting, furniture, stages, gobos, customized pillows, stickers, tables, fabrics of all colors, ceiling treatments, and everything else you can think of that creates a successful Sweet Sixteen party and everyone will love and remember! 16 only comes once after all. A celebration to mark a teenage girl’s passage from childhood into adulthood is called a Sweet Sixteen. Everyone wants to celebrate the occasion differently and whether you want a formal event or a casual one, we can cater to your desire and help you to usher your girl into the new stage of maturity in her life and world. We view your Sweet Sixteen Birthday Party as a big responsibility that we don’t take lightly. Turning 16 is a milestone celebration and is considered a close second in importance to your daughter’s wedding day. So a Sweet Sixteen is a lot more special than an ordinary birthday party.